CAROGA — The fate of the former Sherman’s Amusement Park property is still in limbo after a March letter from Town Board members regarding the property’s future was released and another proposal tabled. At Wednesday’s Town Board meeting, residents questioned board members regarding the future of the Sherman’s property. After March’s meeting, the town issued a letter to give residents the most up-to-date information on the property. The letter ran in The Leader-Herald and discussed how the town came to own the property, the initial legal and logistical issues faced by the town with ownership of the property and the conclusion the Town Board came to that owning and maintaining the property would not be fiscally responsible for the town or its residents. The town has received three proposals for the property– one from a developer and two from Caroga Arts Collective. However, residents still had some concerns. Former town supervisor Beth Morris was first to comment. Supervisor James Selmser said there hasn’t been much of a change. He said the board is waiting on one document and will hold off any actions or decision until they have that document. Selmser said until then, they can still receive other proposals. He did not specify what the document was or who it is from. Councilman Jeremy Manning said there would also be multiple public hearings. 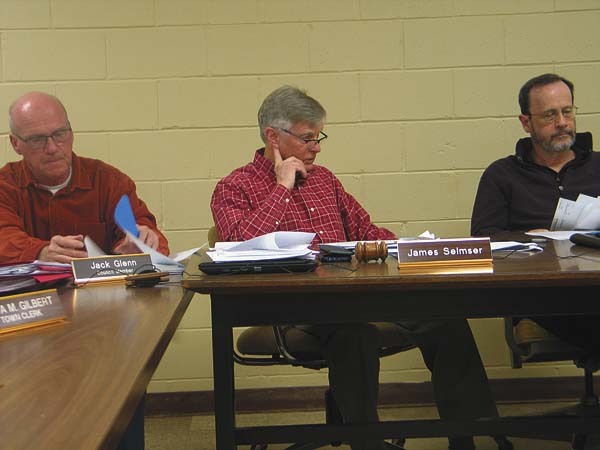 Last month the town went into executive session to discuss the most recent proposal. Selmser said they felt the proposal was incomplete, so action on it was tabled. Of the three proposals, one is from John Lawrence, who is originally from Johnstown and now owns property in Caroga. He made a proposal in 2016 which included a combination of revisions to the Sherman’s property, which included building a mix of restaurants, retail stores and condominiums. From the letter released in March, most board members seem to be leaning to the most recent proposal from the CAC. It was originally reviewed by a citizens committee and discussed with the town board, and since then, the CAC made revisions on the proposal. The previous board never took any action on the original proposal. But the published letter suggested the deal with the CAC may be the most fiscally and legally responsible use of the iconic property. “…we have been negotiating with the Caroga Arts Collective for a possible sale of the Sherman’s property. They have proposed to use the site as a year-round arts and education center, performance space, conference center, potential future town hall space and maintain the grounds for public use. We have received other proposals, but due to the high possibility of a costly lawsuit with Mr. [George] Abdella, lack of detail, limited public benefit, as well as concerns about the lack of adequate wastewater infrastructure at Sherman’s that could ultimately cause the return of the property to the Town, we have decided to not pursue them at this time,” the letter stated. When Abdella gave the property to the town, a stipulation in the contract, that was later rescinded by the Town Board, was that the town could not sell and profit from the property. Abdella has indicated if the property went to the CAC, he would not pursue legal action against the town. “This board is continuing to discuss [the future of the property] and look at some [of the] possibilities,” Selmser said. Morris questioned whether Sherman’s would have to go out to bid since it is town property. “Our attorney advised us they don’t feel it necessary under a certain law, but attorneys may have different opinions, so it is just the interpretation,” Selmser said. Morris said if the town were to go out to bid, that they would inform the public. “If we are going to entertain a sale, it can’t just be for one group, it has to be open for many,” Morris said.